"Never stop writing!" that's what my dad said to me. Writing is a hobby that has become my profession. 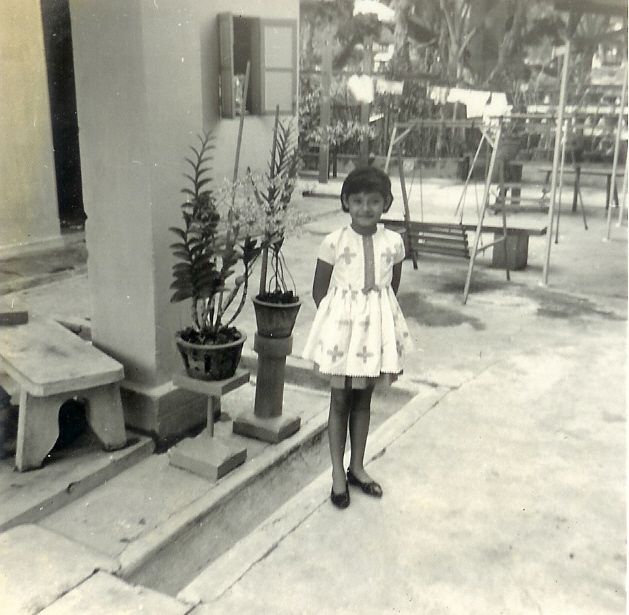 I will never forget the excitement of seeing my first Letter to the Editor published in the New Straits Times in 1970. 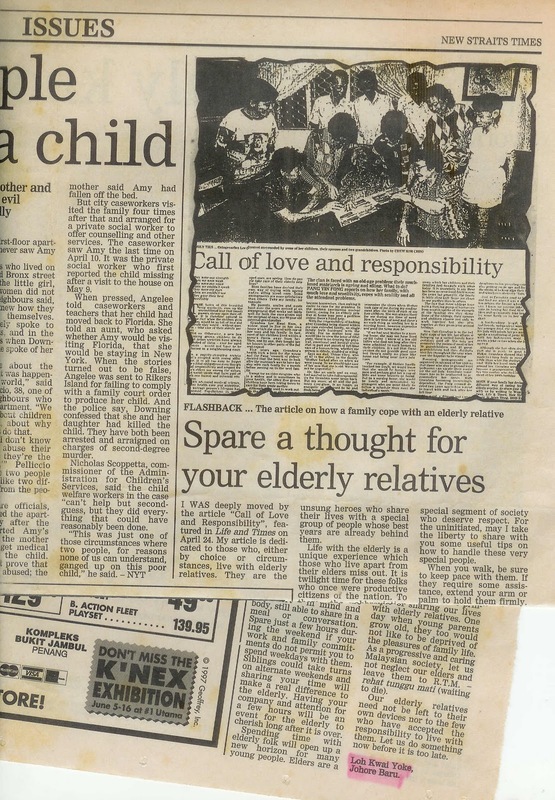 Another memorable published piece was my comments in the New Straits Times [Spare a thought for your elderly relatives, 5 June 1997] on a feature [Call for love and responsibility] about caring for the elderly. Incidentally, when Uncle Cyril read it, he recognized that it was my article from the writing style but had to check with Linda to confirm that it was really me because I used my Chinese name as writer. Even he knew that the subject on caring for the elderly is very close to my heart because our grandma lived with us until recently. She has since moved to live with my aunt's family in Kuala Lumpur. Grandma passed away peacefully at age 103, on 2 July 2015. 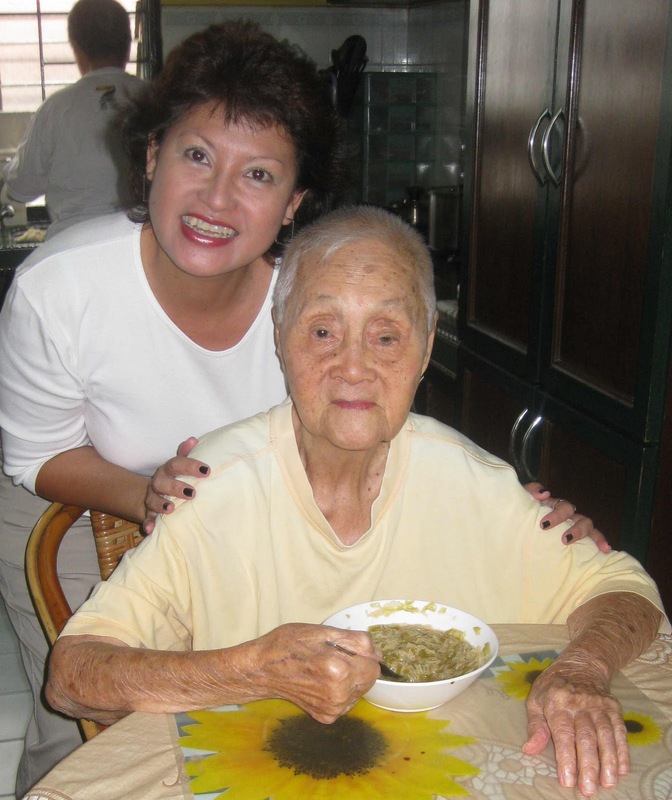 For almost 20 years I was part of the team with my parents who cared for grandma in our home so caring for the elderly is second-nature to me now. I had fun with the English language when I joined an advertising agency as copywriter and many years later, I still wrote freelance for agencies and clients. As copywriter, I wrote copy specifically skewered to clients' campaigns but with the media, there's a wider audience. All my past experience was good training as I now write for the mass media using language that everyone from schoolchildren to senior citizens can understand without having to reach for a dictionary! I started with The New Straits Times (NST) as a Johor-based writer for Travel Times, contributing to various segments like Destinations, Gourmet & Shopping Trails, Hotel Watch, Culture Heritage and Traveller’s Tales. In early 2008, I was invited by Kraftangan Malaysia under the Ministry of Unity, Culture, Arts & Heritage, to go on a Southern Craft Trail to see the One District, One Industry (SDSI) initiative of Kraftangan or Handicraft Development Corporation of Malaysia. It was an eye-opening trip where I met traditional craftsmen of local products that are unique to Malacca and Johor. After this exciting experience, I wrote a 2-part feature for Travel Times. I felt strongly that these Johor craftsmen deserved to be further highlighted so I took the opportunity to feature them separately in Johor Buzz, the southern section of NST now renamed Johor Streets. After these interesting features were published in Johor Buzz, the NST Johor Baru bureau chief encouraged me to contribute more regularly. Since I’m a true-blue Johorean, he also invited me to contribute to the My Johor page, a column to share my experiences about the Johor I once knew and to give my opinions on the Johor of today. You can find my regular columns in the New Straits Times for Johor Streets and Travel listed here (more here). The creative process for the birth of this blog was an interesting learning period for me and I could not have done it without the expertise and patience of Chris, my blog sifu. My grateful thanks to Chris for your creative input and a friendship I treasure. This blog is a gift to you, my readers and I welcome you to take time to read to your heart’s content and at your own convenience. And then you can give me some feedback in the comments section.